Bedtime is winding down time for most people. For many nocturnal creatures though, including rats, nighttime can be one of the most exciting parts of the day. The dark might be your signal to climb into bed, but for rats it signals the time to socialize, explore, exercise and eat. Animals can be nocturnal, diurnal or crepuscular. A nocturnal animal, like the rat, will be most active during the night, while a crepuscular animal will be most active at dusk and dawn. A diurnal animal, like humans, will be active during the daylight hours. While pet rats are very social animals and will adapt their schedules somewhat to fit yours, they are primarily nocturnal animals and will do most of their activities at night. While you're tucked safely into your bed, what will your rat be doing? 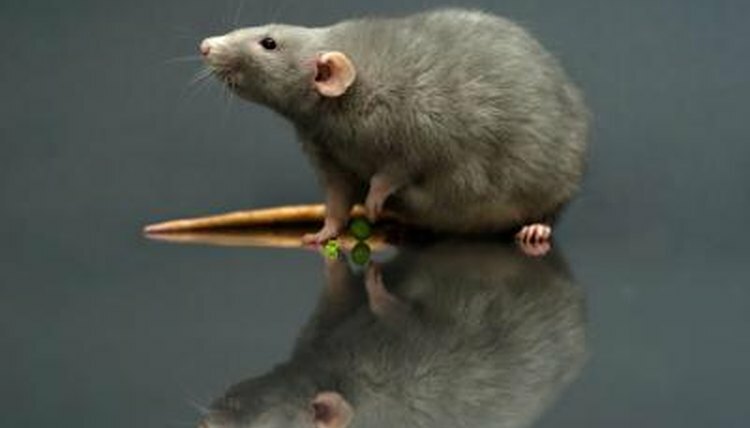 Rats spend quite a bit of their active time foraging for food. In the wild, a rat may have to cover quite a distance to find a food source. Your pet rat at home will like the challenge of searching for food in her cage. Make life interesting for her by scattering her food in different corners, or filling safe toys with food for her to discover. Both wild rats and pet rats are very social creatures. They will use the nighttime active hours to play, work on their "nests" or to get some much-needed exercise. Pet rats may spend most of the night running on exercise wheels, exploring tubes and climbing the cage. Rats will also communicate with each other during the night. Rats communicate using high-frequency sounds, called ultrasound. A rat will use ultrasound communication to locate other rats. A female will rely on her young's high-pitched sounds to orientate herself to her babies' location in the nest. Males and females will communicate as part of the mating process. Most of the sounds rats emit are too high-pitched for humans to hear. Any audible squeaks are often sounds of distress or pain. Male rats will also communicate through scent-marking. A male rat may use scent-marking at night to follow his trail back to his nesting place. Your rat might be up all night, but that doesn't mean you have to be too. Rats are not noisy pets, but if the constant sound of the exercise wheel bothers you, or if you are kept awake by the chewing and rustling of paper and bedding, you might want to place her cage in another room. Make sure your rat's cage is in a dimly-lit room during the day, so she can sleep while you are at work. Given how busy she will be at night, your rat will need all the sleep she can get. The Humane Society of the United States: Is a Rat the Right Pet For You?